Duggar Family Blog: Duggar Updates | Duggar Pictures | Jim Bob and Michelle | Counting On | 19 Kids: Jessa and Ben...19 Kids? In the midst of wedding planning, Jessa Duggar and Ben Seewald are also discussing the size of their future family. The engaged couple recently told ABC News that they are looking forward to having kids together and that it is quite possible that they will have their own super-sized family one day. "Whatever God's plan is, we’d be good with that!" Jessa Duggar told ABC News. "It's probably not possible for me to have 19 kids naturally, but we might adopt and get up to that number." Both Jessa, who is number five of 19, and Ben, who is the oldest of seven, enjoy having little ones around. "We both love kids," Jessa told ABC News. "We'll play it by [ear] as we go along. We’ll see how it goes!" The future Mr. and Mrs. Seewald also announced that they plan to tie the knot before the end of the year. Why is it "not possible" for Jessa to have 19 children??? Happy for them :) I wonder why jessa feels like she wouldn't be able to have 19 naturally? She's very young yet. Wow!!! That's so cute, and I love their dresses!! Lily and Ellie: Can you maybe post a video of the Duggar girls doing a make up tutorial????? I really am shocked to hear Jessa wants so many kids.Now with Jill I definitely can see her having a super size family. they'll be hysterical parents-- in a good way. Jessa no nonsense but fun, and Ben super loving. But why on EARTH would it not be a possibility for Jessa to have 19 naturally? Is she okay? Or is she just saying she doesn't think that will happen? Either way, they'll be fun parents! Congratulations to both of you .when they look at each other there eyes are twickling and can tell they are totally inlove. I love the Duggars, no drama, no fighting. This is the only show that has men respecting woman and it's so nice to be able to was the Duggars with my 10 year old daughter and know we are not going to have to turn the channel when something bad comes on. Because it doesn't. Thank you for being on TV. I love watching your show! I totally agree with you! I raised my children in church but my eldest fell away from his faith and began to question it. While I've been watching The reruns this week he started to watch this program on his own. I believe God used this family and program to bring him back to his faith in Christ and he realized what goodness there still is in the world! Thank you TLC for such a wonderful program, I always feel so good after watching it! I wish there was more families like this in the world!!! adopt??? really. While I think they would be wonderful parents, I thought this was a big no no!! Annas sister adopted because she couldn't have children and wasn't she banned from the recent family wedding? I am glad to hear that Jessa and Ben aren't so closed minded. God bless you both. Michelle and Jim Bob talked about adopting, so I didn't see it as a no no. I never heard Anna's sister being banned from a wedding. What??? Anna's sister was banned from a family wedding because she adopted??? I am a Duggsr fan....is this true? Must be more to it. Adoption has never been taboo with the Duggars.All of them have expressed interest in adopting, especially since there travels abroad.Sorry someone told you false information about this family.It wouldnt be the first time nor will it be the last im afraid. Until someone actually adopts, I won't believe it. Discussing it and doing it are two different things. Discussions may just be a way to keep interest going, while actual intentions are not there. That is a complete falsehood about Anna's parents.They have got to be the sweetest people besides the Duggars, they would NEVER discriminate their childs choice for adopting a child, especially if she couldnt have one of their own.This is fact not fiction as i happend to know this family well.I really dislike rumors, some people will believe that rubbish and spread those rumors. Hi! When is TLC going to come out with a 6th season of 19 Kids and Counting DVD? Wonder why Jessa said its not possible for her to have 19 kids naturally? I was thinking the same thing. She is still young and comes from very fertile parents! She said 'probably not possible'. It's probably not possible for the majority of women so she's right. She got a late start compared to her mom, so thats probably why. Michelle was 21 when Josh was born. Jessa is 21 now. She's not getting a 'late start'! Do the duggars believe Jesus will return again? Wow, you must not watch the show.I recommend that u do ,you will learn the answer to that question,and you will enjoy, a clean, loving, tastefully done reality show. 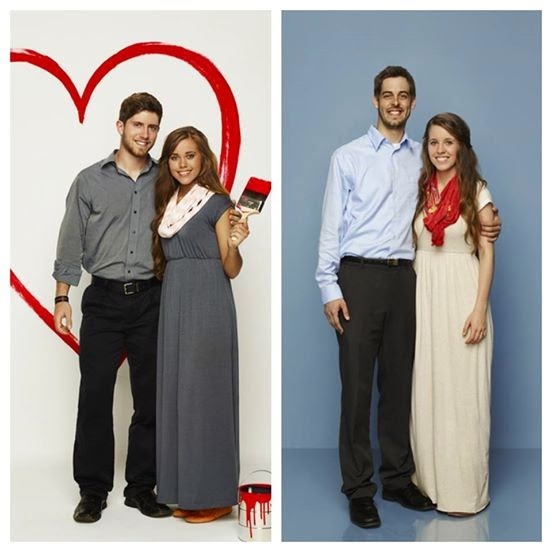 Very nice to see Jessa dressing more conservative like her sister Jill for that promo. Guessing it created balance for the shot but hope it continues especially now she is spoken for. Hey guys Im so happy for you and ben! when is the wedding? Im also happy for jill and Derick on their first child!!! I don't think adoption is a problem. Michelle has talked about adopting before. Adopting isn't a sin. Michelle's even discussed it as an option for her and Jim Bob. I don't think its a no no with the Duggars,maybe the Keller's have a problem with it. When are you going to update the pic of Jessa to include Ben? Jessa is matter of fact sort of person so she tells as she sees it. Her mother Michelle had 19 children because she is one of the few people who can still get pregnant when breast feeding. Jessa will have calculated her possible future pregnancies based on those who cant get pregnant whilst breast feeding and also the fact that the average womb normally can only take so many pregnancies with out issues such as prolapsing etc and also how many miscarriages the average woman could have when trying to have a large family and any other issues along the way. Then there is the thought of how could I have so many children is that really possible for me ? How would I cope with all of that ? So then she would be thinking God will only give us what we can manage and then she would be weighing all this up has concluded probably about ( e.g.) 10 children in her matter of fact way. As Jessa tends to looks at things in a matter of fact way this AND this is how she expresses her self - this is likely the reason she said " its probably not possible for me to have 19 kids naturally "
What date will we see Jill's wedding?! I'VE BEEN WAITING FOR A LONG TIME!!!!!!! Please put the date up, for everyone can see, PLEASE I don't want to miss it, Thanks!!!!! I bet they will get started with their family right away like Jill and Derick are. What a graceful answer Jessa gave. Yeah I also wonder why Jessa said that Amy..? What is wrong is they want to adopt? I think that should be up to Jessa to decide. I wish they would show more of Jana and John David on the show. Of course they are allowed to adopt. Jeez,even the Amish are allowed to adopt. michelle : if yo guuys adot will you use a J name... or keep the child name he/she already have?? Amy Watson, It's not especially easy for everyone to have 19 kids, although it is possible. In addition to the narrow opportunities to get pregnant each month, nursing often delays fertility naturally. Congratulations to Jessa& Ben and to Jill&Derick!!!!!! I think Jessa said that because she is already 22 and will be 23 in November (very close to her wedding day I'm sure) I'm pretty sure Michelle was like a few years younger, but ya know she's taking a guess, and she may not think she is capable of that many kids. And she said it's PROBABLY not possible. Lily and Ellie do you know where they got their gorgeous dresses from?? They are so cute!!! Jessa and Ben I am very encouraged by your courtship ways and I plan on doing the same. Our family agrees with almost everything you do!!! Jill and Derick, Congrats!!!! Even though you have never met me, and you don't even know what I look like I feel very very happy for you!!!! I'm also beyond excited to watch your show. We do not have cable and so we have to buy them on amazon. Or watch them on youtube. I feel very blessed to be able to watch you all doing everything i will do. by: a 14 year old girl. Lily and Ellie: where did they get their dresses?? Congratulations i have enjoyed following youe love story so far!! I love the girls maxi dresses, can they say where they got them? So modest but flattering to their faces! I wonder what color she picked for her wedding. And why she thinks she can't have 19 kids?! Maybe she meant that she might not have 2 sets of twins and would have to have 19 separate pregnancies and this is difficult? Also, pregnancy is so touch on woman's body in general, and Michelle is a miracle who was able to carry so many pregnancies to the end, have healthy pregnancies with no complications for herself and to have healthy kids. She could have so many things like kidney failure, or issues with uterus after being used so many times. Also, she had kids in her 40s too, which is not usual too. Michelle IS a miracle in this sense. Love the duggars and their show. Wish all the couples best wishes n prayers. Good luck in the future. Countries abroad have rules about family size and age and they expect things like sending kids to college. There are kids in orphanages but they are not orphans in the sense their parents are dead in most cases, in some cases. Governments and charities would rather conveniently feed and education children and that means their being in one spot. I would hope having how many The Lord decides really means letting The Lord pick the the number and not trying for a specific number. Children are a blessing, they are not the only blessing. Our country also has income requirements before they let a child come into the US from abroad. A family adopting one child would need to prove an income of 150% of the poverty line. A family of 9 including the child adopted would need an income in the 100K range. A child from another country may not like the idea of being the Hispanic or Asian face in three hundred miles. A parent who expects instant obedience is not going to be very compassionate to the struggles of a new child joining the family. They would have to change expectations. They would also have to come up with other solutions to discipline. Some countries would have issue with homeschooling. You would have to show you live near doctors who can treat the child's known medical issues. Some kids have been through much in their short lives and adding a child with that sort of life to a family with existing minor children is not the best idea. They would be better with a family with no kids. A woman pregnant in the US about to place a child isn't placing an orphan. Most adoptions have nothing to do with orphans. Most people don't have that many. Jessa is right. But remember the family didn't intend and didn't try to get pregnant every year of their marriage. I don't think she is too old. Usually the women in the bible who were mentioned had one kid in unusual circumstances after they were thought to be barren. Wasn't Elizabeth a good woman to have John the Baptist? I do not understand the need for a certain number of kids? Michelle spent years not having kids. She isn't too old. The photographs are good. The idea for Jessa and Ben's photo is typical to the other ideas they have been using for their photo themes and it is a cute idea. I was wondering who took these pictures? Was it Jinger Duggar by any chance? At least the photographer does not spoil the photos by putting their big white signature all across the bottom! Your family is very encouraging and a great example of following the Lord's will. My husband and I are expecting a baby boy in November, 2014 and I sincerely hope he is as well behaved as all of your little ones! You have inspired my husband and I to strengthen our relationship with God and to be more family-oriented. I had read that Bill Gothard was the one who had a problem with adoption. When we receive Jesus Christ as our Savior, however, God adopts us into His family! Obviously the Duggars don't follow every one of Bill Gothard's beliefs. I would Love to know where they found these dresses!?! Lily and Ellie can you please share if you know! Hello Lily and Ellie, I too would love to know where Jill and Jessa purchased their maxi dresses. Even just a brand name would be helpful. Jinger is also wearing the same dress in navy color for their recent 19 Kids photo shoot. Because three of the girls have the same dress, I figured they weren't purchased from a "thrift" store. I would like to have a modest maxi dress like that for myself. :) Thanks! I'm sure they will have the size family that is meant for them weather it be natural or adopted. Very excited for all that's to come! I hope you get to see each of their children court and plan their lives with their fire spouse! I wish people would stop questioning about the buy used save the difference thing. Obviously as the girls get older you have to expect them to buy their own clothing and other things they would like for themselves. Their parents are the ones who have to employ it, being responsible for all those kids and all. It's kinda weird that while Ben and Jessa started courting before Jill and Derrick, the relationship with Jill and Derrick really blossomed into quite the love story. Not that Ben and Jessa aren't as in love, not taking away from their relationship, but Jill and Derrick's story took on a life of it's own and TLC ran with it, while kinda leaving Ben and Jessa like sidekicks on double dates, and a little bit of time meeting his family and him meeting hers. TLC didn't show their relationship blossom as much. We don't know much about Ben, like what he likes to do, besides see Jessa. TLC doesn't show much of his hobbies, or other friends, what he does for a living, what kind of service he did while on mission trips. They kinda leave him on the sidelines. Yes, thats so true.I think since Derrick's more popular and well liked , they need to let us get to know him better and maybe all the haters will change their opinion about him. duggars and love the sow. #10 that is the meanest thing thing u could say that is soooo mean i do NOT NOT NOT NOT NOT agree.